Do you have any big weekend plans? Well, you do now! 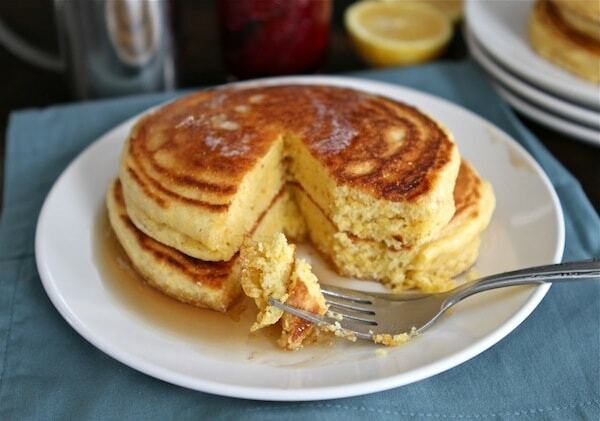 You are going to make these Lemon Cornmeal Pancakes. I don’t mean to be bossy, but you really need to make these pancakes. They are amazing! I got the recipe from my good blogging bud, Jenna. We made them a few weekends ago and I can’t stop thinking about them. I love making special breakfasts on weekends and these Lemon Cornmeal Pancakes are definitely special. The pancakes are thick, hearty, with a refreshing lemon kick. We served them hot off the griddle with a dab of butter and pure maple syrup. I was in pancake heaven. I wanted to eat the entire stack because they were so good, but I had to tap out at one. These pancakes are very filling. We saved the leftover pancakes and enjoyed them the next day for breakfast. They were just as good reheated. Treat yourself to a special breakfast this weekend and make Lemon Cornmeal Pancakes. I can’t wait for Saturday morning! Josh better not sleep in because I am going to be waiting for my Lemon Cornmeal Pancakes:) For the recipe and step-by-step photos, check out my post on Tasty Kitchen. And make sure you checkout our giveaway for a SodaStream machine! You have until Sunday night to enter! Good luck! These are definitely going to be a big part of my weekend plans, they look amazing!! Also, what’s your favourite Easter recipe? Look at the thickness of these pancakes!! Amazing! Mmmm…anything lemon-y is right up my alley! 😀 These look fantastic Maria! Love the lemon in these! 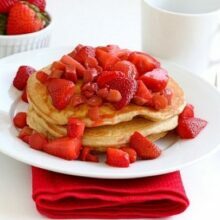 I have never made cornmeal pancakes, but those look absolutely amazing. You have a way with food, Maria. Truly. Happy Friday! Pancakes are a great weekend treat. These look so fluffy! Amazing! I just added them to my Pinterest Recipe Inspiration board! I NEED to try these!! Yum! They look great. Anything with lemon I love. They do look great! Anything with lemon I love. I made cornmeal pancakes for the first time the other morning and I seriously have been thinking about them ever since! I LOVED the cornmeal taste + texture. And I love lemon, so I’m definately going to be making these pancakes 🙂 I imagine they would be wonderful with some blackberry sauce! First of all, I absolutely adore your blog. I’ve tried a few of your pancake recipes before and they were delicious. As someone who is new to living in SLC, I have been having the hardest time adjusting to cooking at this altitude. All my old recipes that were tried and true are suddenly disastrous! I’ve been looking online but can’t find any specific alterations to make.. just lower oven temp? Anyways, do you have any advice for baking in salt lake? I would REALLY appreciate it. Your pancakes look amazing!! Yum, yum, yum!! Wanted to they this too after I saw this on Eat, Live, Run. Yum! These look so lovely. I’m imagining them with a great glob of Greek yogurt right in the center. Love it, Maria! 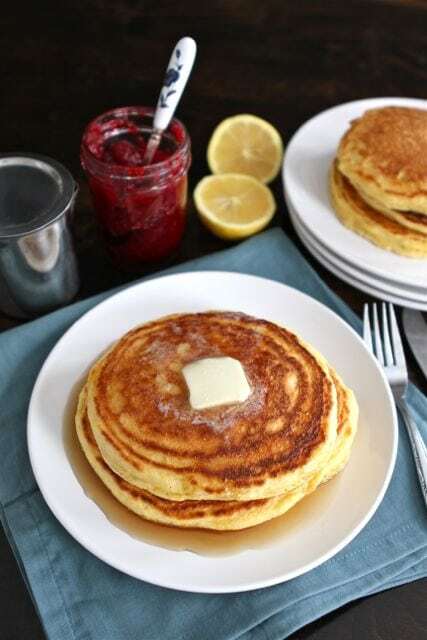 I don’t normally eat pancakes b/c the aren’t very filling and I end up hungry an hour later, but the cornmeal lemon pancakes sound wonderful this morning! Love you and these pancakes! Only wish we could enjoy them together! I saw these last week when she posted them and put them on my to do list! Beautiful photos, Maria! Happy weekend to you!! 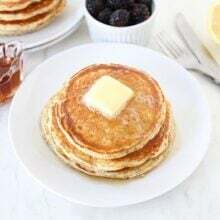 This recipe is now the only weekend plan that matters 😉 I’m big on cornbread and have never put cornmeal in my pancakes – this just sounds fantastic! Your pancakes look fluffy and warm and I’d love a stack of them! I’d probably slice up banana and spread Greek yogurt all over them. Thanks for the great recipe! Gorgeous!! Love the lemon & cornmeal combo! Brilliant! I love cornmeal pancakes, and I’m especially loving the lemon twist!! The fluff on those pancakes = incredible! Yum. Making tomorrow morning. With blueberries! You had me at lemon and pancakes!! These look perfect! I adore cornmeal pancakes. Ever tried them with rosemary and peppers? It’s so savory and fantastic! 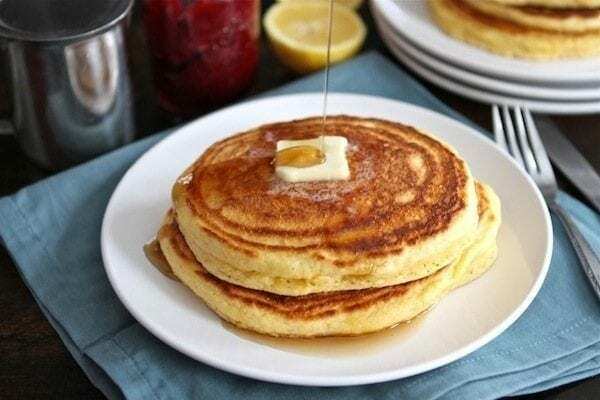 I am on a big lemon kick at the moment, and these lemon corn pancakes sound perfect! YUM! This looks amazing! I want to try these! As a staunch pancake enthusiast, this recipe is right up my alley, and a variation I have yet to try! I think you’ve convinced me, I might have to make them in the morning! These look delicious. Thank you for sharing the recipe. these look FANTASTIC. I love lemon ANYTHING. Okay, YUM!!! Gonna make these for sure on Sunday! My little guy LOVES lemon flavored anything. I love making special breakfasts on the weekends too. Thanks for the inspiration! Holy cow those are thick pancakes! I love it…and they got together quickly so they would make an awesome breakfast for dinner night after work. Thanks for sharing! That is one fluffy pancake and I love that! And I love cornmeal so this is a match for moi! We have pancakes almost every Saturday morning and it will be great to have a new flavor for this week! Thanks!! Yummy! I was planning to make a lemon pancake recipe for breakfast later. This would be it! Look and sound wonderful! On my Sunday breakfast list, for sure! I have just *died and gone to heaven*. Those are the dreamiest pancakes that I’ve ever seen. Yum…reminds me of some lemon cornmeal pancakes I ate once at a restaurant many years ago, but yours are thicker. I’d love to try them. Love the idea of lemon and cornmeal together in a pancake. 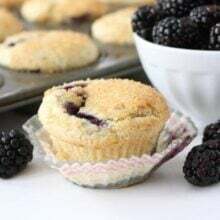 Will definitely make these soon! These look like they are cooked perfectly and the lemon flavor sounds so good along with the cornmeal. well the weekend is almost over and I’m JUST seeing this…but there’s always next weekend! These sound delicious! Y’all make the best breakfasts at your house! I saw these over on tasty kitchen, made them and loved them! Yay! Glad you liked the pancakes! There is nothing more satisfying than a thick and hearty breakfast. Can’t wait to make these for a cozy weekend! I love making pancakes! I will have to give these a try… glad you solved what to do with my lemon in the fridge.